I have been around the auto industry for 30 years starting my career there. I have been lucky enough to work with the top car dealers and manufacturers in the world. As an automotive-insider I know all the tricks of the business. When people find out about my connection with the auto business they ask me two questions; 1) "How do I get a good deal on a car?" and 2) "Should I lease or should I buy?" 1) Use it and lose it. A car is a piece of machinery. It is simply a piece of equipment used to get where you want to go. There is no valid reason to own a car, the thing you want to do is simply use it and then get rid of it. 2) Control of cost. With leasing, you are able to control the cost of your usage based on time and distance. By leasing, you can get in and out of a car limited to how much you use it. 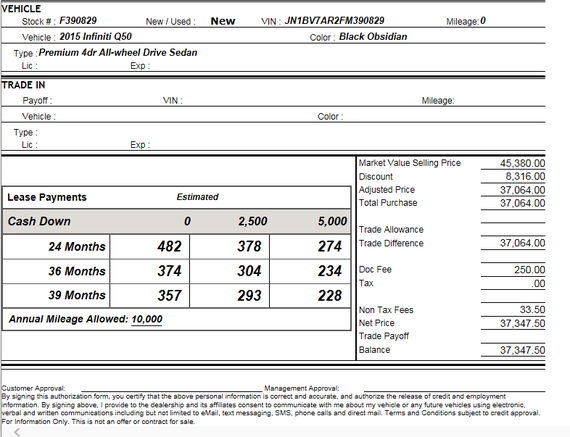 Those that put high mileage on a car (contrary to popular belief) should lease as the user can exact the cost of usage. 3) Better deals. The deals are almost always better on leases. The way to get the best deal on a car is to work the manufacturer, not the dealer. The dealer doesn't control the best deals the manufacturers do. When Honda wants to take market shares from Toyota, for example, they will increase the residual of a particular model thereby reducing your monthly cost. I show an example with Infiniti below where Infinity has aggressively set residuals to make them more competitive. To make this work you can't get emotional about a particular name but look for the best LEASE DEAL. Almost everyone would be better off leasing because of the way the industry is today. 4) Lease depreciating assets, don't own them. There is no reason to own a car or anything for that matter when you know it's going to go down in value. The argument against this is when you lease you will have a payment forever. That's right, and when you own you have payments that are unpredictable. The perfect lease would be 24-36 months (shorter the better) and get out before there are issues not covered by warranty and before models change. 5) The lease agreement protects you against future loss. A lease is like putting a stop on a stock or getting life insurance. The lease protects you from the downside of eroding market conditions. If the future value of the car were to depreciate more than anticipated because of new models, abundant inventories, or a failed economy you are protected against future downside with a lease. 6) Don't believe the fantasy of ownership. Pay to use the car, not for some fantasy of ownership. There is no reason to pay for the future value of the car. You are paying to use a car not for its value in the future. 7) Never worry about selling or trading your car in. At the end of the lease cycle, you simply turn the vehicle in. The dealer will take a report of its condition and as long as there is no damage or excessive wear and tear or mileage you are done with it. 8) Bigger tax deductions. The write off's on leases are almost 6 times larger than ownership. For a business owner who owns a car, the write-off is limited to fifty-four cents for every mile you drive the car for business. So 10,000 miles would equate to $5400 and the interest on the loan. If you leased the same car and used it 100% for business you could write off 100% of the lease payment with no limits. 9) Stay dynamic. Get in and out quicker for less money down and a lower cost per month. Traditionally you can get into leases for less money down and less monthly cost. See the offer below from my friends and owner Bernie Moreno of The Auto Collection which own dealerships from Boston to Cleveland down to Miami. 10) Leasing is easier and quicker. Because the manufacturer believes that leasing makes for the possibility of renewing a customer on a receptive loyalty program (repetitive purchases) they make everything easier and quicker. And the dealer loves to lease again for the same reasons. 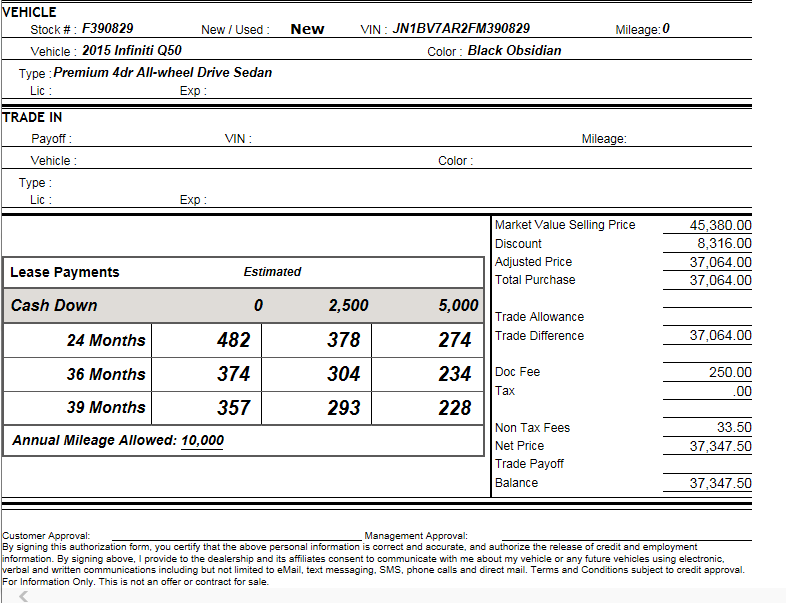 My friend and mega auto dealer Bernie Moreno, owns dealerships in Ohio, Kentucky, Massachusetts and Florida provided me this comparison lease on Q50 $45,000 automobile would cost $632 per month for 72 months with no money down or only $374 per month for 36 months on a lease. Also, notice you will see almost $4000 greater incentives to the buyer that were passed on to the leaser. If you are ever looking for a car or a career Bernie Moreno is a great example of American success story. He sets the example for taking care of both his employees and customers. And when you are visiting a car dealer tell them you are my friend and I bet you get a better deal.